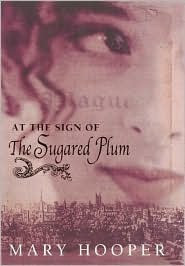 At the Sign of the Sugared Plum was written by Mary Hooper. It is the first book of a series. It is 1665 and Hannah is full of excitement at the prospect of her first trip to London. She is going to help her sister, Sarah, in her candy shop, 'The Sugared Plum'. But Hannah does not get the welcoming reception she expected from her sister, because the Plague is taking hold of London. However, Hannah is determined to stay and together the two young women face the worst-with the possibility of their own demise, growing ever closer. But through it all they persevere with the support of their neighbors and each other. And at last, they find hope in a daring attempt to escape the city. I'm not sure why I chose to read this book. It's not quite my normal read. I believe it might have come up on the Amazon deal list? (I could be wrong.) I can tell you I wouldn't normally see a description about a girl living in London during the Plague and decide I wanted to read it. That said... I really enjoyed the story. I suppose I shouldn't be surprised since I seem to be enjoying historical fiction aimed at young adults/young readers more and more lately. Maybe it's a new genre to be added to my favorites list? I will tell you that when I just looked at Mary Hooper's website and found out that there is actually a follow up to At the Sign of the Sugared Plum I quickly hopped over to Amazon and downloaded it. The end of Hannah's story was so obviously not the end to me. I'm excited to find out what happened after the "attempt to escape" London and the Plague. There also seems to be a 3rd book only available on the Amazon UK site. Hmm. Oh... and I'm still not quite sure why in the world you would call candies and sugared flowers/fruits "sweetmeats". I could use a little "happiness" right about now.